Although Plaxico Burress might not have the best judgement in the world(shooting himself in the leg), he has great taste in cars and rims. We had poster his CL63 earlier and now he has put a nice set of 22″ Forgiatos on his black Maserati Gran Turismo. This time he went to The Auto Firm in Miami for the set up. The wheels are all black with chrome grooves and a red pinstripe to match the braked. It came out great. Look forward to seeing Plax make a comeback to the NFL this season, possibly to the Miami Dolphins? 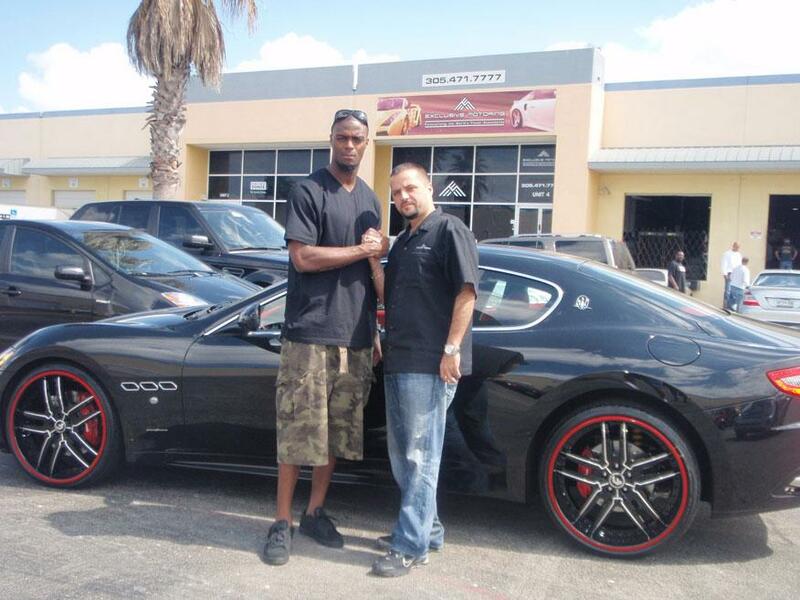 Here you have Super Bowl Giant – Plaxico Burress’s CL63 completely customized by Action Tire in Lodi, NJ. The fact that Action Tire worked on this car, you know its going to be sick. This car is no exception. Chrome and Black Estremo wheels on this white Benz. You dont always have to color match your wheels to your car, the contrast is what makes the wheels stand out.